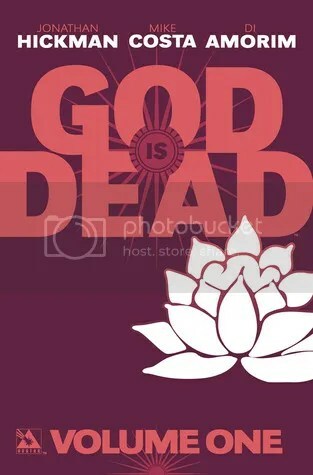 God Is Dead has exactly the sort of deliciously chewy premise that Jonathan Hickman and Mike Costa known for. 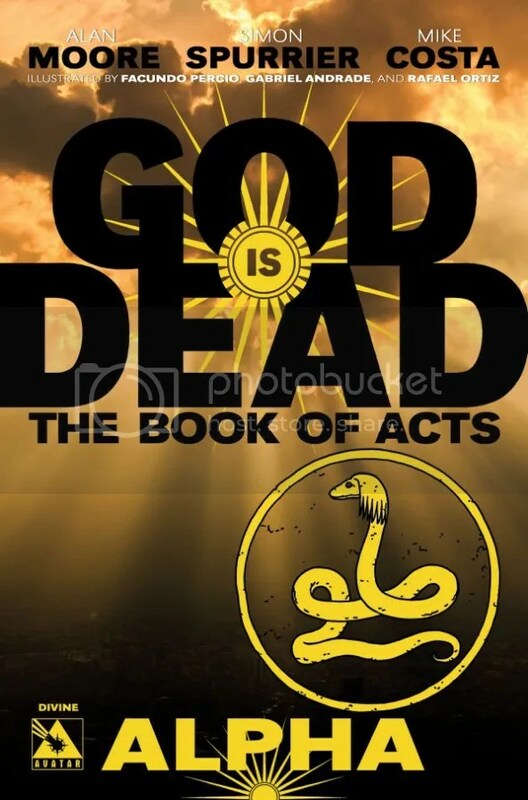 It’s the story of what happens when every single God in human history is revealed to not only be real but returns to Earth. All at once. Hickman and Costa’s story follows two principle strands; the god war and the effect it has on us and the efforts of a small group of scientists to build an artificial God and put humanity back in the fight. It’s a smart move and lets him the writers have their cake, ritually sacrifice it, parody it and then punch it in the face all at once. The Gods are tropes given flesh, creatures of immense power and scale who Hickman also, cleverly, shows are inherently limited. These are beings who want, who are defined by that wanting and the wars they wage are as much to pass the time as anything else. They’re savage, creatively brutal and, ultimately, have a gravitational pull not even they can escape. They define the very world they seek to control and in the end can only wage war. The moment they win, the moment there is a one true God, then they begin to stagnate. It’s a fascinating idea dn it allows Hickman to fold in some great moments of jet black humour. 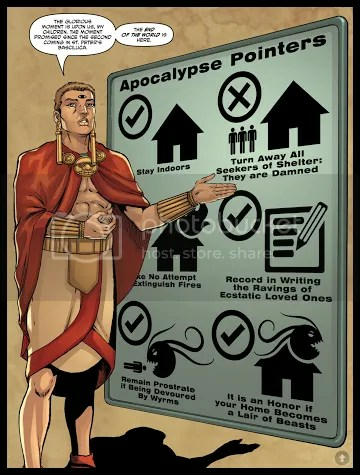 A news anchor covering the apocalypse fest is a nice example of this; he starts out as a standard anchor and by the end of the book is ritually sacrificing himself. It’s a nice touch, simultaneously funny and horrifying and that dichotomy is where the book lives. The human element of the book makes this even clearer. Hickman and Costa take the standard ‘ragtag group of geniuses and soldiers’ trope and almost turns it inside out. The soldiers are a father and daughter private security team who are intensely smart in their own right and the role they end up playing is genuinely surprising. In fact, the book’s best scenes come from the scientist’s attempts to reverse engineer a God and what happens when they (mostly) succeed. Hickman and Costa balance the metaphysical and gristly physical tremendously well, and their plot is the most compelling part of this first volume. By the end of the volume the survivors have not only got what they wanted but found themselves imprisoned within their own success, just like the gods they’ve emulated. It’s a smart, circular piece of storytelling that, again, marks the book out as something very clever. Di Amorim’s art is, for the most part, astonishing. Rendering the gods with this level of clear eyed detail had the potential to make them elss than what they are but Di Amorim somehow makes them even more disturbing. These are impossible creatures whose presence, and stories, are warping the world around them and it almost never feels safe or predictable. That creates a tremendous sense of unease that, accentuated by the book’s tremendously bloody violence, only ratchets the tension higher. Likewise the design work on the Gods, their weapons and the war they wage is as intricate as it is brutal. Unfortunately when the book does go for safe and predictable, it really stumbles. Gaby, a security professional on an operation is dressed like she stepped off a metal album cover and two of the scientists, Thomas Mims and Henry Rhodes, are pretty clear analogs for Einstein and Hawking. Both these design choices drag you out of the book and trivialize what, up until that point, has been a surprising, and very dark take on religious belief and the apocalypse. The book recovers, but those early moments strike a bum chord that reverberate for a good long time. That aside, there’s a lot to enjoy here. Hickman and Costa have done a ton of research and used all of it to drive character and plot to a fascinating end point. Di Amorim’s work is uniformly good and frequently great and Juanmar’s colours and Kurt Hathaway’s lettering seal everything together perfectly. It’s gory, visceral, horrifying, often very funny stuff and it tries far more new things than old. For that reason alone it’s worth picking up. 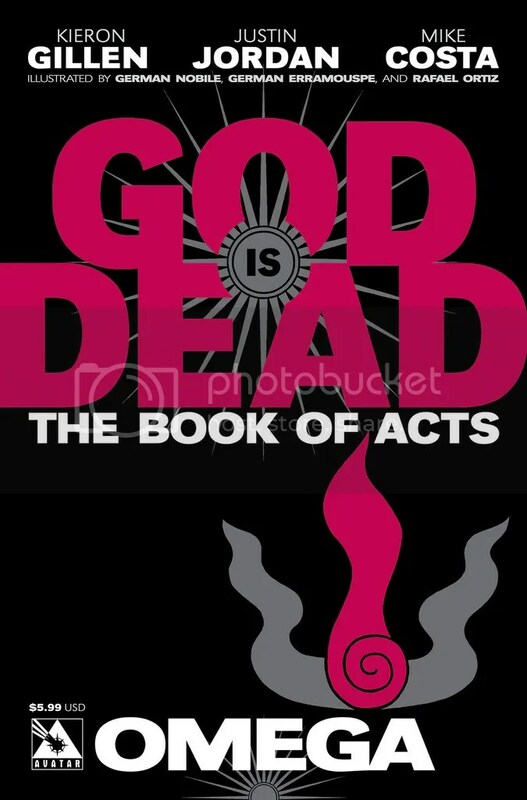 God is Dead volume 1 is out now from Titan, priced £14.99. The ongoing series is published monthly by Avatar. Book of Acts, a two part anthology series set in the same universe is also available now from all good comic shops. It’s BRILLIANT, features Kieron Gillen, Si Spurrier, Alan Moore and others and is a perfect on ramp for the series. Give it a shot. I’d recommend asking Mondo Comico or Travelling Man. Also, thanks to the lovely people at Titan for the review copy.